xSIG 2019 uses EasyChair as a paper submission system. 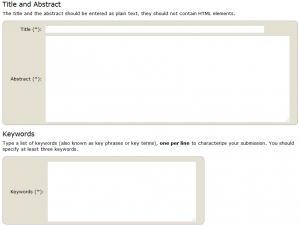 This guide introduces the steps to submit your paper with EasyChair. If you have not been using EasyChair, you have to create your EasyChair account first. Follow the steps of “1. Creation of your EasyChair account” on this page to create your account. To submit a regular paper or a poster, access the EasyChair submission page for xSIG 2019 and click the “New Submission” link. By clicking the above link, you will be asked to log in to EasyChair. Enter the information of all of the authors in English. The information will be used for our English program. One or more author(s) must be “Corresponding author.” E-mail notification from EasyChair will be sent to corresponding author(s). If you want to add your information associated with your EasyChair account, click the “click here to add yourself” link. If your paper has four or more authors, click the “click here to add more authors” link for an additional form. Enter the title of your paper in English. 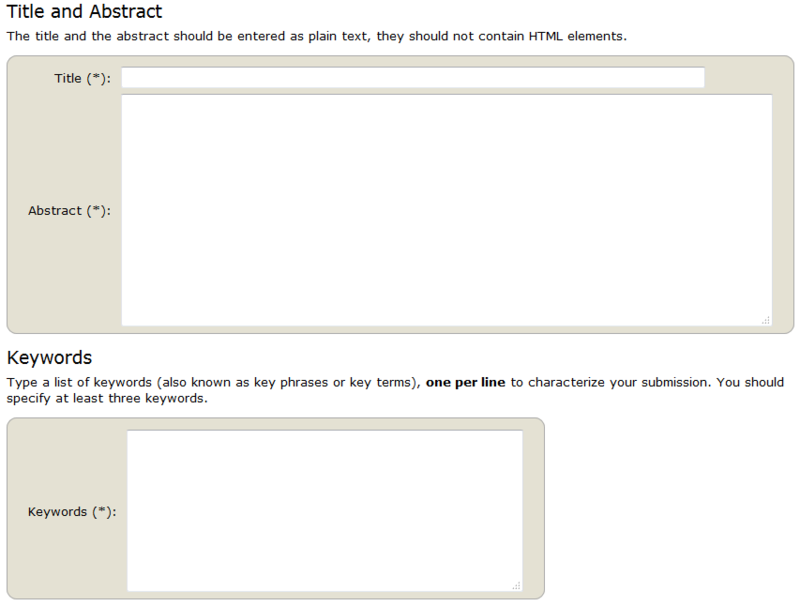 Enter the abstract and keywords in the same language as your paper. Keywords must be separated with line break. Three or more keywords must be specified. Check the “Other Information and Uploads” form. Select a “Category” that fits the best with your paper from the candidates. If two or more categories fit with your paper, select all of them as “Secondary Category,” other than selected above. This information will be used for assignment of reviewers. If your paper is written in Japanese, provide the names (affiliations) of all of the authors and the title of the paper to the “Authors and Title in Japanese” field in Japanese. If not, leave it blank. This information will be used for our Japanese program. If the first author is an undergraduate (including KOSEN students) or master course student as of Feb. 2019, select the proper item from the “Grade of the first author” menu. If you want to receive review reports in English, check the “Language of review reports” box. If you upload your paper at the same time as registration, select your paper (which must be in PDF format) and upload it. Check the forms again and click the “Submit” button only once. Check if you are successfully registered and your paper number is assigned. You can upload your paper, update your paper, and correct the information of the submission until the paper submission deadline. Click the “Submission <your paper number>” menu. If you upload or update your paper, click the “Add file” or “Update file” link. If you correct the information, click the “Update information” or “Update authors” link. Note that you must upload your paper until the paper submission deadline. Submissions without uploaded paper will automatically be withdrawn. E-mail notification from EasyChair will be sent to corresponding author(s). If you want to add your information associated with your EasyChair account, click the “click here to add yourself” link. If your paper has four or more authors, click the “click here to add more authors” link for an additional form. Enter the title of your paper in English. Enter the abstract and keywords in the same language as your poster. Abstract should be around 200-400 characters (in Japanese) or 100-200 words (in English). Keywords must be separated with line break. Three or more keywords must be specified. Enter the summary of the information of the authors to the “Authors and Title in Japanese” section in Japanese (only if your poster is written in Japanese). This information will be used for our Japanese program. Check the forms again and click the “Submit” button only once. Check if you are successfully registered and your paper number is assigned. You don’t have to upload your poster at this time. You can upload your poster, update your poster, and correct the information of the submission until the poster submission deadline. Click the “Submission ” menu. If you upload or update your poster, click the “Add file” or “Update file” link. If you correct the information, click the “Update information” or “Update authors” link.